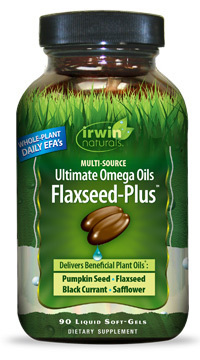 Ultimate Omega Oils Flaxseed-Plus™, 90 liquid soft gels (Irwin Naturals) - Penn Herb Co. Ltd. This balanced blend of Omega 3, 6 and 9 is sourced exclusively from flax, pumpkin, safflower and black currant seed oils. As part of a healthy daily regimen, these plant-based oils can help to nourish your body’s vital organs and promote optimal health and well-being. Essential Fatty Acids: These "good fats” are required on a daily basis and must be obtained through diet or supplementation. Research demonstrates that essential fatty acids play a vital role in the body - from cardiovascular maintenance and immune health to optimal joint and cognitive function. Plant-Sourced Omega 3•6•9™ is a unique plant-based formula that delivers a full-spectrum of Omega fatty acids to support your daily nutritional needs. Adults take 3 liquid soft gels daily with a meal. SEE PDF LABEL FOR WARNINGS.